Pick any 3 performances with $360 ($240 for students). 進念ZUNI是介乎藍與綠的顏色，並是北美洲以創作手工藝著名的少數民族；二十面體ICOSAHEDRON的意譯也是傳播力強的細菌最基本形狀。1982年成立，本地註冊非牟利慈善文化團體，以香港為基，面向世界的實驗藝術團體。現為香港九個專業藝團之一，自2009年起進駐香港文化中心。香港最具代表性的實驗藝團，原創作品逾200齣，曾獲邀前往世界各地逾80個城市演出和交流。多年來，在會員的支持及在聯合藝術總監榮念曾、胡恩威的帶領下，致力拓展香港文化藝術新領域、積極推動國際文化交流、主催藝術評論及文化政策研究等工作，並活躍於藝術教育和發展電子媒體及跨媒體等新類型的藝術模式，近年亦致力促進非物質文化遺產(表演藝術)的傳承和發展。以「經典重現」、「傳統創新」、「多媒體劇場」、「社會劇場」為四大藝術方向。進念的實驗性和顛覆性，不斷啟發著華人社會的藝術和舞台美學發展。ZUNI is a colour between blue and green. In Western New Mexico, Zuni is the name of a tribe of North American Indians who is famous for creative handicrafts. 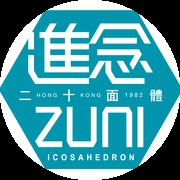 ICOSAHEDRON is a solid figure having twenty faces bearing a strong contagious character.Founded in 1982, is a Hong Kong based international experimental theatre company and a non-profit charitable cultural organization. Zuni is one of the nine major professional performing arts companies in Hong Kong, and has made venue partner with the Hong Kong Cultural Centre since 2009.As a premier experimental theatre company, Zuni has produced more than 200 original productions of alternative theatre and multimedia performances, and been invited to more than 80 cities around the globe for cultural exchange and performances.With the support of our members, and under the leadership of Co-Artistic Directors, Danny Yung and Mathias Woo, Zuni has been active in video, sound experimentation and installation arts, as well as in the area of arts education, arts criticism, cultural policy research and international cultural exchange. Recently, Zuni has also been undertaking the mission of preserving and developing Intangible Cultural Heritage (Performing Arts).With “Reinterpret Classics”, “Reinvent Tradition”, “Recreate Theatre and Media Technology” and “Reconnect Theatre with Social Movement” as our major artistic directions, Zuni has been most inspiring in developing the aesthetics of theatre in Chinese society, with its experimental and subversive nature.